Deconstructing a mystery: What caused Snowmaggedon? In the quiet after the storms, streets and cars had all but disappeared under piles of snow. The U.S. Postal Service suspended service for the first time in 30 years. Snow plows struggled to push the evidence off of major roads. Hundreds of thousands of Washington metropolitan residents grappled with the loss of electricity and heat for almost a week. 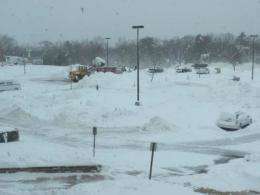 By Feb. 10, 2010 the National Weather Service reported that three storms spanning from December to February in the winter of 2009-10 had dumped a whopping 54.9 inches of snow on the Baltimore-Washington area. The snowfall broke a seasonal record first set in 1899. 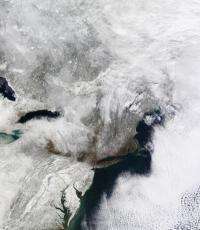 Snowmaggedon, as the winter was dubbed, entered the history books as the snowiest winter on record for the U.S. East Coast. Two years later, scientists are still searching to identify the unique set of conditions that enabled storms of this magnitude to occur. To determine a direct cause to infrequent but major winter storms, Siegfried Schubert and colleagues Yehui Chang and Max Suarez  all of NASA's Goddard Space Flight Center in Greenbelt, Md., became detectives. "There are things that we know that affect storminess over the U.S.," Schubert said. "One is when there is an El Niño, which tends to favor more storms. Given the connection between El Niño and sea surface temperatures, we thought we'd actually do a modeling study to see if we could pinpoint the role of sea surface temperatures in driving the snowstorms." El Niño is an ocean-atmospheric climate pattern characterized by unusually warm sea surface temperatures and heightened rainfall in the central and eastern tropical Pacific. The increased rain occurs when warm sea surface temperatures heat the surrounding air, which then rises and condenses into rain clouds. The end result of these changes in the tropics is a shifting of the extra-tropical air currents, or jet streams. Changes in the jet streams can then alter storm paths around the globe. Over the U.S., El Niño tends to produce an unusual eastward extension of the Pacific jet stream and storminess across the southern tier of states. Using the GEOS-5 model, Schubert and his team isolated the role that sea surface temperatures played in changing the storminess across the Northern Hemisphere. By initializing the model with the early December 2009 atmospheric conditions and the higher sea surface temperatures from that time, Schubert and his colleagues were able to reproduce many of the subsequent changes in winter storminess. "El Niño is predictable on monthly and seasonal time scales. But we know that sea surface temperatures don't control everything about the atmosphere," Schubert said. "Storms develop in the atmosphere whenever they decide to as a result of instabilities. Models can't replicate the actual sequence of events in predictions extending beyond a few weeks, but they can predict whether or not there will be more or fewer storms, because of the sea surface temperatures." Schubert and his team ran 50 different simulations, slightly changing the atmospheric conditions each time while keeping the actual sea surface temperatures the same. In the end, the data showed that the storms were influenced more by the sea surface temperatures, and less by the changing atmospheric conditions. "The atmosphere is chaotic, but if we do this over and over again, slightly changing the initial conditions, we can average the runs, filter out all the random atmosphere variability and see the part that's driven by sea surface temperatures," Schubert said. While El Niño tends to produce greater storminess, it does not necessarily lead to more snowstorms along the East Coast. Without colder temperatures, these storms bring just rain. Cue the second culprit: a fluctuation of the atmospheric pressure differences in the Atlantic between the Icelandic low-pressure field and the Azores high-pressure field further south. The North Atlantic Oscillation, as it is called, controls the strength and direction of westerly winds, as well as storm tracks across the North Atlantic. Scientists cannot predict these fluctuations very well. But it is known that in a positive phase, the north-south pressure difference is enhanced and the west-to-east winds are strong, effectively creating a wall that keeps cold air in the Arctic. In the negative phase, the north-south pressure difference is reduced, allowing cold Arctic wind to bear down across the North Atlantic. "It's a structure that tends to favor cold temperatures on the East Coast when it's in the negative phase," said Schubert. While the atmospheric pressure fields oscillate at daily and weekly time scales, the winter of 2009-10 saw the North Atlantic Oscillation in a strong extended-negative phase. Combine the resulting influx of Arctic air for an unusually long period of time with the moisture and storminess from El Niño, and the once fuzzy cause of these monster storms starts to come into focus. The research shows that the extreme weather over the Eastern U.S. in the winter of 2009-10 was part of a response mainly to El Niño and its associated Pacific Ocean sea surface temperatures. The results were then compared with those of a winter (1999-2000) characterized by having completely opposite conditions: a La Niña and a positive phase of the North Atlantic Oscillation. When compared with Snowmaggedon, the winter of 1999-2000 showed less storminess and decreased chances of snow. This comparison helped Schubert and his team corroborate the hypothesis, confirming that El Niño-induced sea surface temperatures and an extended negative phase of the North Atlantic Oscillation caused the changes in 2009-10 winter storminess. In order to improve snow predictions, scientists need to better understand how the North Atlantic Oscillation works and what causes it to stay in an extended period. There is evidence that the extended negative mode is impacted by sea surface temperatures and maybe even snow cover in Asia. Scientists, however, have not directly linked any one weather variable to the North Atlantic Oscillation. "People have done these historical studies before to come up with measures, and if you look at the record of major snow storms, some have occurred during El Niño winters and a negative North Atlantic Oscillation phase," Schubert said. "But sea surface temperatures impacting storminess in the different ocean basins has never been quantified and it's never been clear what is a relative contribution and in what way they are contributing," he added. Richard Seager, a research professor at the Lamont-Doherty Earth Observatory at Columbia University, also studies how El Niño and weakened atmospheric pressure contributes to snow anomalies. "This model not only confirms that a negative North American Oscillation and El Niño conditions created the conditions that allowed these storms to form," said Seager, who did not work with Schubert on this research. "But it is useful in showing how the atmosphere can act differently when combining El Niño with different sea surface temperatures. These models provide controlled conditions, which allow us to be sure about the exact causes," Seager added. Scientists have predicted that current La Niña conditions and below-average sea surface temperatures might be the cause for the mild 2012 winter on the Eastern U.S. Examples like this, Schubert said, is why it is important to better understand the relationship between sea surface temperatures and storminess. "People want to know whether it's going to be a snowy winter. Snow prediction is developing but if we predict El Niño, we know it will be more likely stormier. Now whether those storms will be rain or snow depends on the North Atlantic oscillation, which is a big challenge for us because of its constant oscillations." Schubert and his team's extended findings on the role of sea surface temperatures in Snowmaggedon will be published in the Journal of Climate this spring. Glad to hear that some of the variables in the North Atlantic Oscillations, sea surface tempratures, the El Nino and La nina are being studied. Though I am no Pro in weather and have just a hobbie intrest in weather I always thought that there was a link between these variables and the jet stream that produced the "Snowsquach" storms. the importance of better understanding is key to prediction.